Chlorine is used on drinking and swimming pool waters, in cooling circuits and in the tertiary treatment of municipal wastewaters. It is mainly used to disinfect water but also to control the development of various organisms (algae, mussels, shellfish). It can also oxidise compounds responsible for taste and odour, oxidise iron and manganese, remove colour, improve coagulation; however, it can also create noxious by-products, resulting in other oxidants to be preferred. Chlorine is distributed from storage containers into the water through a dispensing unit called a chlorinator (see chlorine). Sodium hypochlorite in solution is injected direct into the water, usually by means of a dispensing pump. The same applies to calcium hypochlorite after it has been dissolved. If hard water is used to dilute hypochlorite solutions scaling may occur. In all cases, it is essential that the chlorinated stock solution be completely and quickly mixed with the the untreated water. Therefore, the stock solution is injected into a waterfall, with agitation through an in-line mixer. Also, contact tanks need to be laid out to best prevent short-circuiting, which results in the untreated water to bypass the required contact time. The amount of chlorine to be dispensed is established after measuring the chlorine demand for the water to be treated and the residual free chlorine concentration. 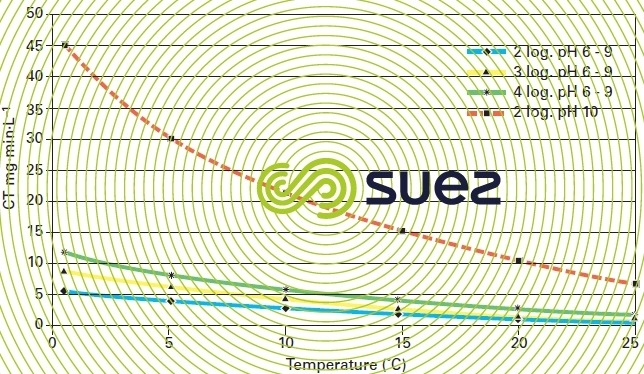 The required contact time is primarily linked to the treatment objective, to the presence of interfering compounds (suspended solids, compounds susceptible to oxidation) and to chlorine application conditions: free chlorine concentration, water pH and temperature, contact quality (mixing, reactor’s hydraulics). The rate at which micro-organisms are inactivated increases as the temperature rises. The sizing of chlorine contact tanks is based on the CT parameter (product of the residual disinfectant concentration, C, in mg · L–1, by contact time, T, in minutes). For each pathogen that requires inactivation, the CT is established on the basis of temperature pH (table 1). Pathogenic bacteria and poliomyelitis viruses can be eliminated by maintaining a concentration of 0.5 mg · L–1 of free chlorine for a contact time of 30 minutes and pH below 8. On the other hand, the protozoa cysts CT values render the use of chlorine impractical due to the extremely large contact tanks that would be required and the high risk of THM and HAA by-products formation from a competing reaction with the organic matter present in the water. Contact tanks are designed so that they are as close as possible to the ideal reactor, with an actual residence time that is close to the theoretical contact time (reactor volume divided by flow rate). The reactor’s geometry should simulate a plug-flow hydraulic. Typically, the actual contact time is assumed equal to the elution time T10 when 10 % of the tracer injected has discharged. The ratio of T10 to theoretical contact time provides information on how much deviation there is between an actual distribution of contact times and that of an ideal plug-flow reactor. 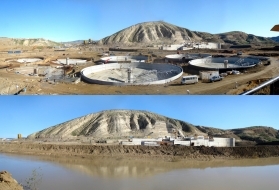 This ratio varies between 0.1 and 0.7 depending on tank geometry and can be increased by inserting baffles that create channels that can be up to 50 times longer than their width (figure 4). There must be sufficient available chlorine in the distribution system to prevent bacterial regrowth and the development of micro-invertebrates. 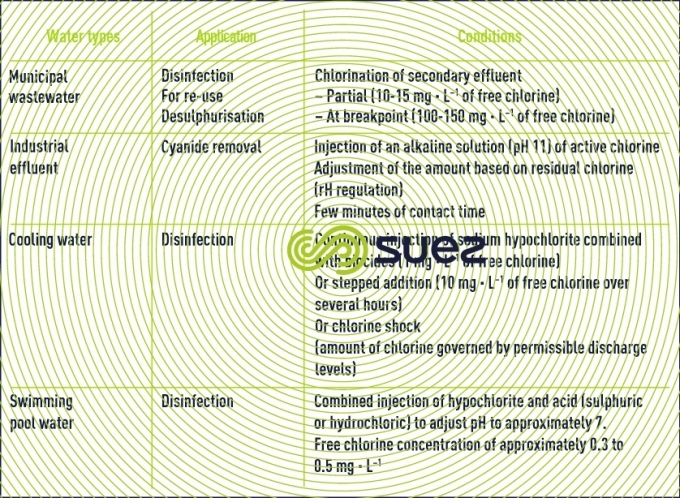 Available chlorine concentration must be equal to at least 0.1 mg· L–1. It is adjusted at the network inlet according to its configuration maintenance requirements and to the quality of water. When the distribution network is large, chlorine may need to be injected at various points such as at intermediate reservoirs. Please refer to table 2, provided as guidance for the general conditions applicable to chlorine used in the treatment of water other than drinking water.